93579 is a standard mark 1 General Utility Van built at Glasgow works in 1959. Many hundreds of these vans were built and they became the standard parcels and mail van type on the railways right up to the present day. Over the past thirty years they have been used to carry everthing from cars to newspapers, many remaining in sevice until the end of Royal Mail contract in January 2004. 93579 ended its active life at Derby, where it was racked out for use as a stores vehicle. 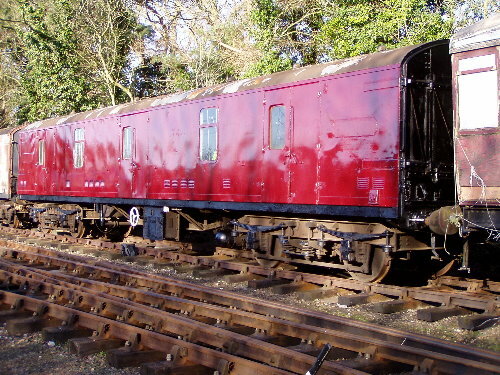 Donated to RVP in 2003 by Fragonset Railways Ltd it has been repainted maroon and continues to be used for storage.